The recent downing of a Russian jet by the Turkish armed forces has again highlighted Turkey’s chaotic domestic situation. The honeymoon period afforded to President Erdogan, resoundingly vindicated for his hard-line political stance in the November elections and the subsequent bounce in the value of the Turkish Lira, is well and truly over. This has been a tumultuous year for Turkish politics and Turkey in general. A general election in June resulted in a hung parliament and the ruling Justice and Development Party (AKP) refusing to cede power during negotiations with opposition parties. A snap election was called and a second electoral cycle in almost as many months begun. The result was the AKP returned as a majority party to govern over a country torn apart by ethnic, religious and ideological divisions. These divisions bubbled to the surface in October, when the deadliest suicide bomb in Turkish history killed 102, mostly Kurdish, peace protesters in Ankara. Then on November 24 the Turkish armed forces shot down a Russian jet running bombing missions over northern Syria, ostensibly because it strayed into Turkish airspace for less than 20 seconds. The downing of the Russian jet had the world on edge for 48 hours as NATO awaited the normally bellicose President Putin’s response. However, his response was uncharacteristically measured while being pointed in his admonition of President Erdogan, his autocratic Middle Eastern soul mate. The response of Putin was in stark contrast to the sabre rattling which emanated from Ankara following the incident. Ankara made a point of insisting it would not apologise for the incursion into its air space, whilst its NATO allies tried, somewhat in vain, to drag the coalition’s efforts and attention back to ISIS. A lack of remorse from Turkey has lead to Russia effectively halting Russian tourism to Turkey, a huge part of the Turkish tourism sector, and imposing economic sanctions on Turkey. 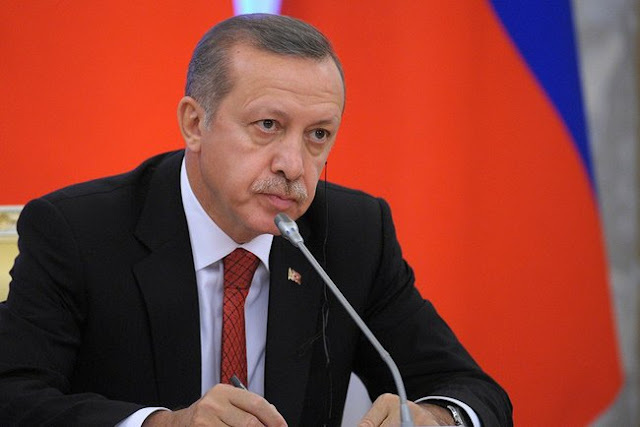 Erdogan made a point of insisting he had given the order to fire on the Russian plane himself, which strongly suggests that the Turkish military had been waiting sometime for such an opportunity to present itself. While Russia was foolhardy to stray so close to the Turkish border, it can hardly be blamed for failing to anticipate such an incident. Turkey, and specifically Erdogan, have been very public in their dislike of Bashar Al-Assad and his Baathist government in Syria, causing direct conflict with Russia. Turkey has been openly supporting rebel groups with arms and money and most importantly with the blind eye it has turned to its territory being used as what is effectively a jihadist staging ground. The rebel soldiers who allegedly shot and killed the Russian pilot who ejected from the jet were a group of Turkmen rebels armed and trained by Turkey. Accusations that Turkey has been supporting ISIS through its military intelligence wing, and even through Erdogan’s son Bilal, refuse to go away. Indeed, President Putin has directly linked the downing of the jet and Turkey’s reluctance to act against ISIS, accusing Turkey of shooting down the plan to protect ISIS oil supplies. This tacit acceptance of Sunni jihadism has ruptured Turkish society like never before and has caused far more problems than Erdogan might have hoped it would solve. The government’s verbal and actual war against the Kurds has muddied the waters in Turkey significantly. The Kurds represent approximately 18 percent of the country’s population and Turkey had been moving slowly and inexorably toward a peaceful solution to the decades-old ethnic war. That is until Erdogan used the Kurdish-backed People’s Democratic Party as the national scapegoat for his own failures and launched air strikes on Kurdish militia operating against ISIS in northern Syria. The metropolitan areas, more commonly represented in government by the traditional secular party the Republican People’s Party (CHP), have also been treated poorly as memories of the Gezi park protest movement have been largely crushed through Erdogan’s relentless harassment of the free media. The Turkish government recently arrested two editors of the independent Cumhurriyet newspaper. Recent years have seen the steady erosion of freedom of the press in Turkey, with nine journalists arrested on charges ranging from treason to revealing state secrets. Cumhurriyet Editor-in-Chief Can Dundar and Ankara bureau chief Erdem Gul have said they will wear these charges “like a badge of honour”. They are currently imprisoned because they revealed that Turkey is shipping truckloads of weapons into Syria, something that almost everyone already knew and that Putin has been explicit about since the downing of the jet. Not content with simply arresting the two main journalists at one of the country’s largest and most successful newspapers, the government has also ordered an investigation into the newspaper’s tax records, which seems to be nothing more than low-level harassment for a media outlet that refuses to toe the line. With an increasingly convoluted war on the nation’s doorstep, a growing and seemingly unstoppable refugee crisis occurring in its borders, divisions along ethnic, religious and ideological lines growing by the day and the erosion of freedoms traditionally taken for granted in Turkey, the country looks more and more unstable. This instability and the downing of the Russian jet have led to a dive in the Lira’s value and the end of investor confidence. There can be no denying that Erdogan is still in charge of Turkey and that he is slowly and seemingly unstoppably taking control of more and more of the nation’s institutions. He is the king of his castle; however if he continues down the path he has chosen he may be the king of a very broken castle indeed. Alexander Willox is a freelance international political analyst and an analyst at Political Monitor. He tweets @frederickcon. This article can was originally published at Australian Institute of International Affairs on December 4, 2015, with attribution under a Creative Commons License.